Cooking and baking to me, besides being loads of fun, are definitely a learning process – I think that certain recipes go beyond the deliciousness of their final products: they teach you something. I was making these lemon brioches and after the dough had proved for the first time it was too sticky and too soft to be shaped. That was when I remembered Paul Hollywood’s brioche recipe, in which the dough has to be refrigerated in order to be firm enough to be shaped into buns, and that’s what I did – it worked perfectly. Combine milk, yeast and 1 tablespoon of the sugar in the large bowl of an electric mixer fitted with the dough hook and stir to combine. Set aside for 5 minutes or until mixture starts to foam. Add remaining sugar, flour and salt to the yeast mixture and beat for about 6 minutes on medium speed or until a rough dough forms (my dough was too dry, so I added 1/3 cup of warm milk). Add the 3 eggs, one at a time, beating well after each addition. Add zest, vanilla and poppy seeds, and beat to combine. Gradually add butter, beating after each addition. Continue beating on medium speed for about 8 minutes or until dough is smooth and elastic – it will be very soft. Transfer to a lightly buttered large bowl, cover with plastic wrap and leave for 1 hour or until doubled in size, then refrigerate for 4-5 hours (otherwise the dough will be too soft to be shaped). Generously butter a 12-cup muffin pan (1/3-cup capacity cavities). Remove dough from the fridge and transfer to a lightly floured surface. Knead 3-4 times, then divide into 12 balls. Divide each ball into 3 smaller balls. Place 3 small balls in each muffin hole, loosely cover with a clean kitchen towel and leave for 40 minutes or until doubled in size. In the meantime, preheat oven to 180°C/350°F. 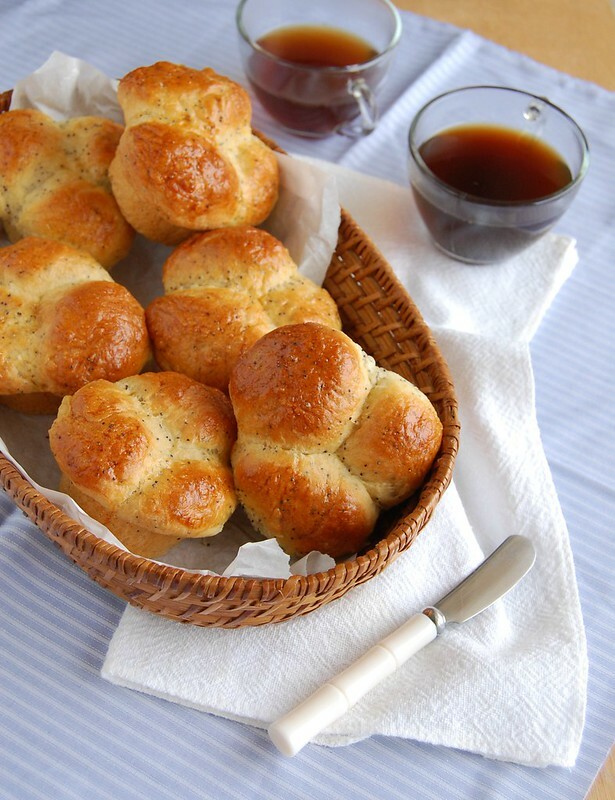 Lightly whisk the egg with a fork and brush the top of each brioche with it. Bake for 20-25 minutes or until golden and a skewer inserted into center comes out clean. Cool in the pan over a wire rack for 5 minutes, then carefully unmold and transfer to the rack to cool. Serve warm or at room temperature (these reheat really well). Such golden brioche buns! I love the lemon and poppy seed together :). Long time no see, Patricia :) and you welcome me with your wonderful brioches. A great recipe to try, seguro! I want to try this, looks wonderful. Of course I cannot use poppy seed because it's forbidden in Peru, but I can use chia seeds...!!! It definitely is a learning experience! I tend to think about how I previously made similar recipes as well. :) And, I love that I can find an abundance of lemon recipes on your blog!